Egypt handball star Karim Hendawy ‘Katonga’ has signed contracts with Zamalek president Mortada Mansour on Monday to join the Whites on a two-year deal from Al Ahly. The national team goalkeeper has joined Zamalek for the second time from Al Ahly after his first time in 2009. He had previously joined Zamalek after leaving Al Ahly for not having a professional contract, then he left Zamalek in 2013 to join Al Ahly on a free transfer because of Zamalek representatives delaying his contract negotiations more than one time. Ayman Salah manager of handball team and Hamada Abdel-Barry director manager of the team have led the negotiations to succeed, after Katonga’s contract expired with Al Ahly. Mansour is currently rebuilding a new squad by buying new players to be able to retain championships after an unsuccessful season. 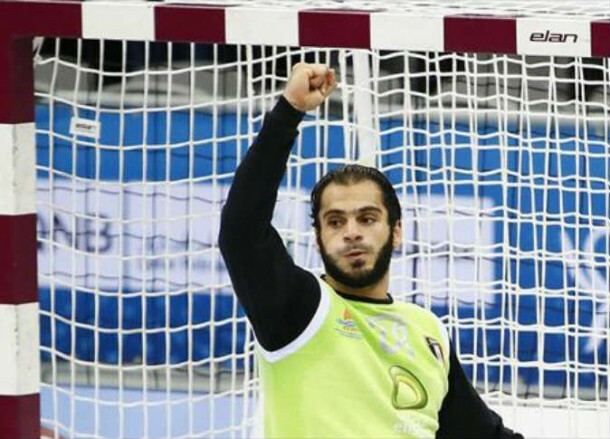 Zamalek have previously announced the return of Egyptian handball player, Ahmed El-Ahmar, to the White Castle for two seasons. Ahmed El-Ahmar, Karim Hendawy, Osama Abdel-Ghany “Tex”, Ramy Youssef, Karim Ayman, Mostafa El-Sayed, Emad Abdel-Wahab, Ahmed Nader, Khaled Hossam are Zamalek new signings for the next season along with Mohamed Mamdouh Hashem who joined Zamalek on Tuesday night.